We're not even in mid-May yet, but local flavorful Cigaline and early Mara des Bois varieties are on the tables at the Croix Rousse market in Lyon. There are also a ton of watery pushed strawberries out there, but we ignore them and go straight for the good ones. The Cigaline berries don't have the color of the Mara des Bois, which is deceptive, because the flavor is deep and vibrant, enough to set us reeling while we hustle on down to get herbs and fresh spring greens for our lunch. We picked these two varieties to make our individual fraisiers, a classic French entremets that includes a very simply made genoise, and crème mousseline, which is crème pâtissière to which you add softened butter. Sounds decadent, yes? These went down so easily even after our mid-day meal of a Lapin en Gibelotte, it was a good thing we limited the servings by making in little rounds. We diced the cigalines and layered them in between layers of the crème mousseline for flavor in the inside, while reserving the prettier berries (that still tasted pretty darn good) to line the outside. The ratios in this recipe are from an old national French professional certification exam. The genoise for this recipe gives you a nice fluffy but also a sturdy cake that can be turned straight out of the hot pan and sliced across without any problem. I love this genoise and it rates right up there at the top as a good white cake for layer cakes. Not only can you use it just as soon as it cools, but it cuts easily into good sturdy shapes should you need them. 1. Make the Genoise: Beat the eggs and sugar over a bain marie (that means putting it in a metal bowl suspended over a saucepan of simmering water to gently heat) until it warms and thickens considerably (50C/122F), changing consistency to something thick and fluffy. Transfer this to a mixer bowl and whisk at high speed until it cools. Add sifted flour and corn starch and gently fold them in. Transfer to a buttered and floured 22 cm (9") round cake pan and bake at 180C/375F for about 20 minutes, until golden brown and slightly retracted from the edges, turning out to a cooling rack directly out of the oven. When fully cool, cut this layer in two discs of the same thickness. 2.Make the crème pâtissière: Measure the milk, egg yolks, sugar and corn starch. Place the corn starch and sugar into a bowl and add the yolks and enough milk to moisten the lot. Whisk until combined. Split the vanilla bean and scrape the seeds from the pod. Put the seeds and the scraped pod into the milk and heat to just about to boil. Transfer the egg and sugar mixture to the milk by delaying it, that is adding hot milk off heat to the egg/sugar mixture and then transferring that to the pan again. Whisk to keep the custard moving and keep from burning or sticking (not to incorporate air) until it thickens and boils. Continue whisking and keep boiling for at least one minute. Letting it bubble and boil is an important step for crème pâtissière, to pasteurize it and eliminate any starchy flavor as well. Remove from heat and pour directly into a lined pan, covering with plastic wrap to keep the lot from forming a film when cooling. Cool to room temp and transfer directly to freezer to chill. Don't let this sit out, because of the heated eggs. When thoroughly chilled, transfer to the refrigerator. 3. Fit the cake: cut circles of genoise to fit entremets rings. Cut smaller circles to be a second layer, approximately 2 cm smaller than the first circle. Nestle the larger circle into the base of the rings and imbibe with kirsch or rum flavored (optional) simple syrup using a pastry brush. Place lengthwise cut strawberries, pretty insides facing out, around the ring on top of the cake. 4. Prepare the crème mousseline: Remove the crème pâtissière from the platter and whisk it by hand to re-soften. Incorporate the butter with the whisk and beat thoroughly. Be prepared to pipe this immediately. 5. 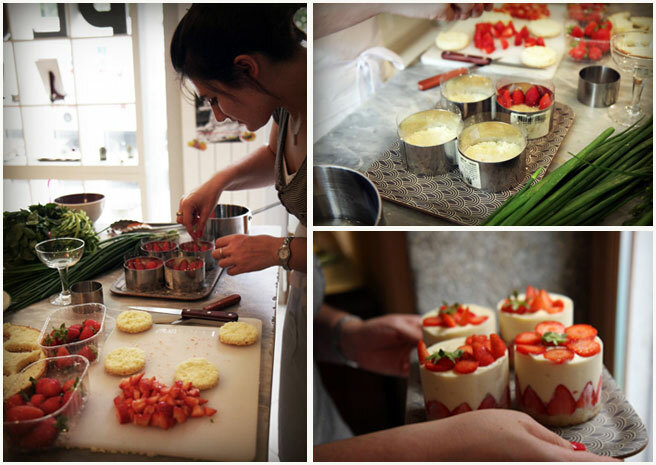 Finish assembly and chill: Pipe the mousseline into the ring surrounding the strawberries and then add a layer of minced strawberries to the center, top that with another layer of crème mousseline, then the second layer of genoise. Top with creme mousseline and decorate as desired. Chill thoroughly before removing the rings and serving. You now have the recipe but a very good way to get this down pat is to make it with someone who's done it before. Call a friend, move your bodies, take a class, have fun, add it to your reperetoire. Great use for leftover crème pâtissière: Make creamsicles! Those are so pretty I can almost taste them! I've never even heard of fraisiers before but I think I need to get some in my life. They look so beautiful and summery. Yum! These look delicious and very doable. Strawberries are in full flush here in Israel - I'm going to print your recipe out and make these fraisiers. You should know you have a fan in Israel! Beautiful. I think I need to get some of those tins. I love this blog. Very beautiful and informative. How pretty are these, a perfect addition to a Mother's day tea! No local strawberries here yet in Nova Scotia! Thanks for the great post. The Fraisier is one of my most favorite desserts. Thanks to your great photos and recipe, I will definitely make it. These little beauties are just gorgeous. We've got wild strawberries running rampant in the garden, I just need to figure out how to get to them before the birds (and slugs) do. What a wonderful post. How beautiful!